What a lovely picture that conjures up doesn’t it? A tiny caterpillar shedding its outer skin and emerging as a beautiful, colourful, fragile butterfly. We are very similar in that we go about our daily lives totally unaware of how special each and every one of us is in the great scheme of things. Perhaps something totally unexpected happens and turns everything upside down for us and plunges us into the depths of despair and uncertainty about what will happen next. 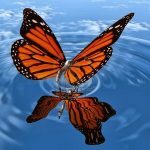 This is when we find we have the ability to cope and actually turn things back around and realise that, while doing so, we have morphed into a beautiful butterfly.